As a manager, it is your responsibility to ensure that your employees are contributing to the best of their abilities. Productivity is everything in a business. The very minute details can affect your office’s production and time management. If you are an office manager and you feel that you need to incorporate new ideas to improve on productivity, here are some tips on how to improve productivity. Teach employees that if they have an office task that they need to get done and it requires less than two minutes of their time, get it done right away. This will greatly improve productivity. But, make certain that the task will take no longer than two minutes. If they suspect it will take longer, then they can add the task to their to-do lists. Otherwise, get it done immediately. It will not take away from more important job responsibilities. In fact, it will take less time to get the two-minute task done right away than it would take if you put it off and added it to your to-do list. Do anything that will take two minutes or less done the second you find out you have to do it, and coach your employees to do the same. Everyone’s productivity is sure to get a boost. Tracking how an employee’s time is used is probably the best way to increase overall productivity. Work needs to be done in order for results to happen, after all. You can make use of software such as Rescue Time to track how much time is spent on email, social media, etc. Then, set expectations for how much time needs to be spent on work. Being aware of how a work day is spent and setting goals for production are proven ways to start on improving productivity in the workplace. That is why these elements are a prominent part of many business strategies for successful management. It may seem counter-intuitive, but breaks are an important aspect of employee engagement. Tired minds and aching hands are an enormous detriment to employees. Their rates of work will fall steadily over the course of a work day and overall production will suffer. In order to avoid this, set reasonable times for breaks and make sure they are spread evenly throughout the day. By ensuring that your employees are healthy and ready to go, you are setting up an optimal environment for increased productivity. As a manager, it will be difficult for you set expectations for production and simply wait for it to happen. Setting deadlines can ensure that a certain amount of work gets done by a specific time. Employees will then work to manage their time better. Knowing when you expect certain tasks to be done and setting clear deadlines for them using mobile scheduling apps are great anchors for guaranteeing an increase in production. Not all production is equal. Some tasks may be more important than others. This is one of the most effective time management strategies. As a manager, you must be clear to employees about what they need to prioritize on their to-do list. If they spend all of their time on smaller tasks and miss out on more important ones by the deadline, you will likely have lost production points. Make sure goals are set for more pressing work, and you will guarantee a higher level of productivity by the end of the week. If you want to be productive in any working environment, the golden rule is to not multitask. Multitasking is often believed to be more efficient, but the exact opposite is true. Doing more than one thing at once actually results in lost time and lesser productivity. Instead of losing time juggling three tasks at once, focus on a single responsibility at a time. When you have finished that task, move onto the next priority. The best productivity tip you will ever receive is to stop multitasking and start prioritizing. 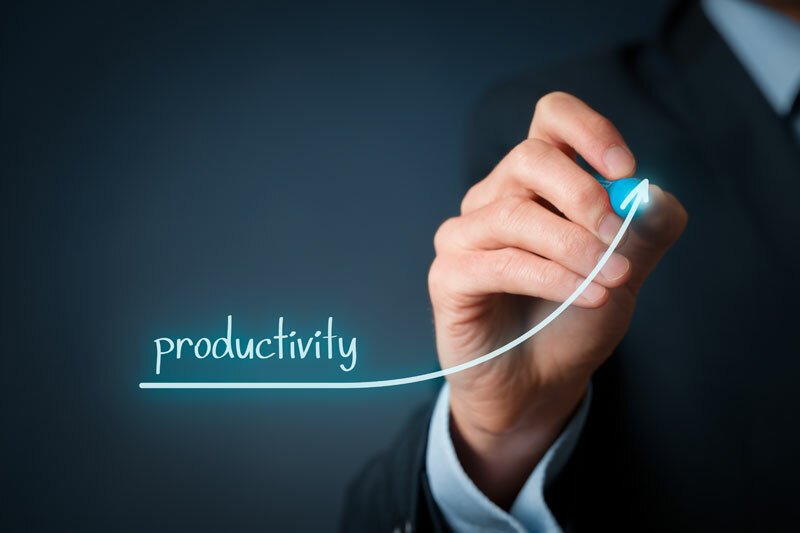 There are numerous strategies you can use to improve the levels of productivity in your office. As a manager, it is your job to incorporate them and make sure your employees are receptive to them. (Even the ones you think may be crazy, like trying to make employees eat healthy in order to increase their production capabilities.) By using the tips listed above and executing them effectively, you can be assured that your office will know how to improve productivity across the board.